OX40, a member of the tumor necrosis factor receptor (TNFR) superfamily, co-stimulates activated T cells following interaction with its own ligand OX40L. Human T-cell leukemia virus type-1 (HTLV-1) is an etiological agent of adult T-cell leukemia (ATL). ATL cells are known to express cell surface OX40; however, the level of soluble OX40 (sOX40) in blood samples from ATL patients is unknown. 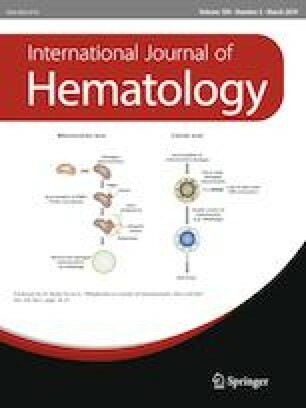 Quantitative enzyme-linked immune-sorbent assay (ELISA) showed that sOX40 levels were significantly higher in plasma from acute ATL patients than those from asymptomatic HTLV-1 carriers and healthy donors, and correlated with sCD25 levels and HTLV-1 proviral loads in peripheral blood mononuclear cells (PBMCs). Fresh PBMCs from acute ATL patients showed a higher percentage of OX40-positive cells compared with those from carriers, and shed sOX40 into culture supernatants. Shedding of sOX40 was partially inhibited by a matrix metalloproteinase (MMP) inhibitor, GM6001. A fraction of sOX40 was capable of binding to OX40L. These results suggest that high levels of sOX40 are shed into blood from a large number of ATL cells in acute ATL patients. Thus, abnormally elevated plasma sOX40 levels may be useful as an additional diagnostic marker of acute ATL. The online version of this article ( https://doi.org/10.1007/s12185-018-02580-z) contains supplementary material, which is available to authorized users. This work was supported by grants from the Project of Establishing Medical Research Base Networks against Infectious Diseases in Okinawa. YTan conceived and designed the study, performed a part of research, provided funding for this study, and wrote the manuscript, YTak processed human blood samples, RT generated mAbs and did FCM, TF and TM collected and characterized blood samples from various HTLV-1-infected donors and normal donors, respectively, and MS quantitated VL. All authors contributed to the final version of the manuscript, and read and approved it.